Chose the correct form of the verb to use in each sentence. Once you've made your selection, the correct answer and an explanation will be revealed. Correct answer: I think he's an interesting man. Explanation: When using 'think' to express an opinion, do not use the continuous form of the verb. 1. Tom __________ at the moment. Can I take a message? Use the present continuous with action verbs such as 'work' with the time expression 'at the moment'. 2. I often __________ tennis on Saturdays. Use the present simple with adverbs of frequency such as 'usually', 'often', 'sometimes', etc. 3. We __________ on the Smith account this week. The present continuous can be used to discuss something happening around the moment of speaking. 4. We rarely go out for dinner, but this week we __________ out on Saturday. Use the present continuous to discuss future plans. 5. He __________ every word she says. 6. Angela gets up at 7 o'clock and __________ breakfast every day. Use the present simple to express something that happens every day. 7. Peter usually __________ a lot of questions. Use the present simple to speak about typical behavior. 8. Jason doesn't know the answer to this question. He __________ the other answers. 9. We __________ a meeting in Chicago this weekend. Use the present continuous to speak about scheduled events, especially when using business English. 10. She __________ to purchase a new computer. A desire is not an action and takes a stative verb (a verb that expresses a state, feeling, opinion, etc.) 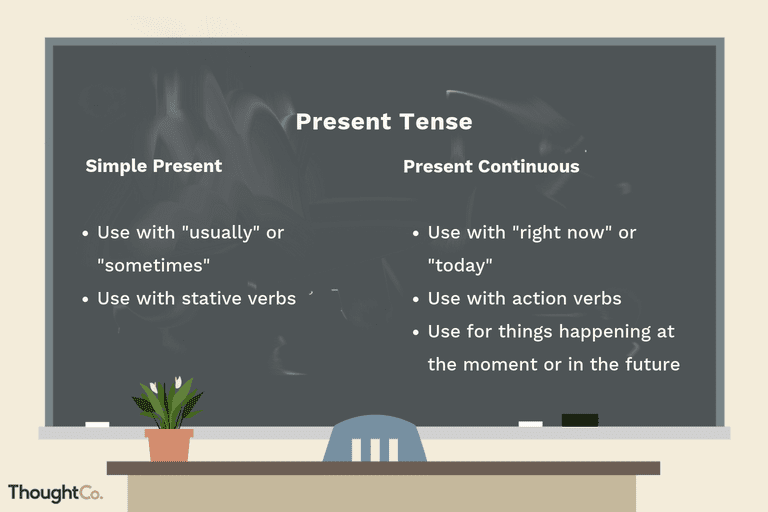 The present continuous is not used with stative verbs. 11. I __________ that this quiz is easy. 'Hope' is a stative verb (a verb that expresses a state, feeling, opinion, etc.) and is not used with the continuous form. 12. Janet __________ breakfast at the moment. 'Have' is not used with continuous when it shows possession. In this case, 'have breakfast' is an action and can be used with the present continuous. 13. My friends __________ in a factory twenty miles from their apartment. In this case, both answers could be right, but would have a slightly different meaning. "My friends are working..." would imply that the friends are working right now, at this time and could be an answer to the question, "Where are your friends?" "My friends work..." implies a habitual action, in other words, that the friends have jobs at the factory but not that they are necessarily working there at the moment. 14. She is always __________ about how much she hates her job. The word always takes the present continuous. 15. The children __________ at the moment by the nanny. This is the passive form of the continuous, but the plural 'are' is required.